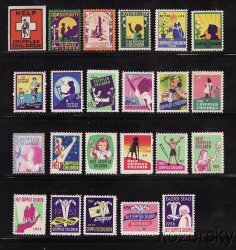 1934-56 U.S. Easter Charity Seal Collection, as required, full gum, F/VF, P4S, MNH. This collection includes the scarce 1934 seal. 1934-56 U.S. Easter Charity Seal Collection, as required, full gum, F/VF, P4S, MNH. This collection includes the scarce 1934 seal. Scan is an example of the collection. This is an excellent start to your Easter Seal Collection. Seals in this packet are as follows: single stamps: for all years 1934-1956. 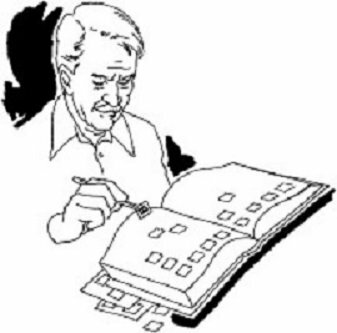 This is the assortment described in the Mosbaugh's Catalog, Sec. 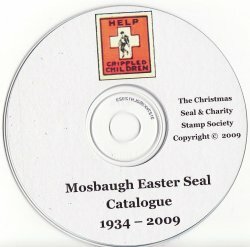 9A, U.S. Easter Seals, and required to complete the various albums. Easter Seals are usually classified as Charity Seals or Cinderella Stamps.